With the objective of building greater awareness and consensus on various issues critical for the country’s growth, CII has launched a new monthly publication called Policy Watch. It is widely circulated to all stakeholders, particularly to membership and government to communicate Industry’s views and recommendations across different sectors. 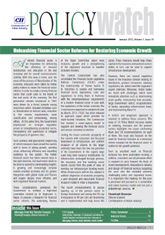 The January issue of Policy Watch takes an in-depth look at the reforms agenda for the Financial Sector and has outlined some specific recommendations on banking, insurance and pension sectors along with the financial inclusion agenda; which would help restore the economic growth on a higher trajectory. The Indian Financial sector has shown promising signs over the last few years. It however continues to be plagued by some specific concerns. Indian banks are faced with challenges such as deteriorating asset quality, recapitalization of banks, expanding infrastructure loans, implementing Basel III, etc. ; whereas in the insurance and pensions domain there are issues relating to distribution, product innovation, solvency regulations, higher foreign direct investments, etc. Among other key areas, financial inclusion also remains a challenging task. CII believes a holistic and pragmatic approach is required in order to unleash financial sector reforms which would help the Indian economy realize its full growth potential. Towards this objective, CII has been able to bring to the fore, the key issues before the Ministry of Finance, Reserve Bank of India, Insurance Regulatory and Development Authority and the Pension Fund Regulatory and Development Authority.